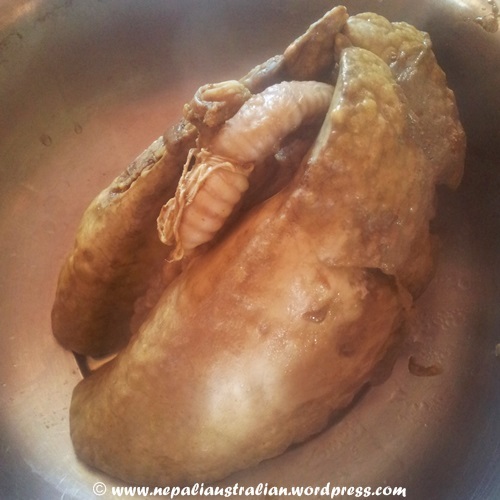 In Nepal, a goat’s brain (gidi), feet (khutta), head (tauko), stomach skin (bhundi), tongue (jibro), liver (kalejo), kidney, lungs (phokso), fried intestines (aandra), fried solidified blood (rakati) are considered delicacies and are in very high demand in Dashain and during festivals. I know some of you might feel squeamish even thinking about eating offal but believe me if you love your meat, you will love these dishes. 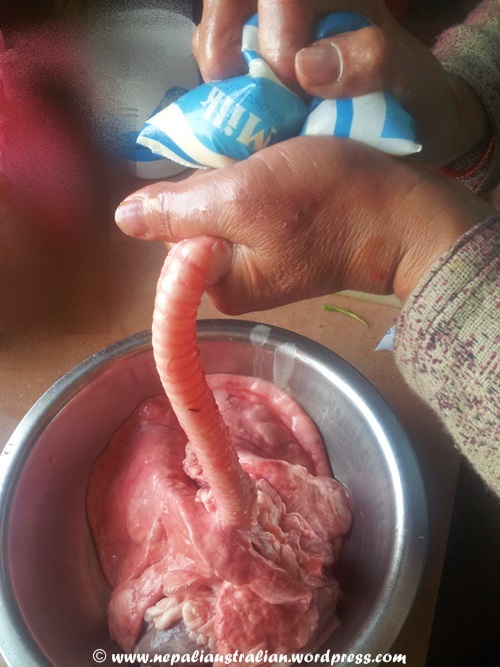 Another is that eating offal uses the parts of the beast that might otherwise be wasted. As it takes 10 kilos of cereal to produce one kilo of meat, then we should not be wasting any part of the carcass. Unless you deliberately avoid meat, eating offal should be regarded as “green”. 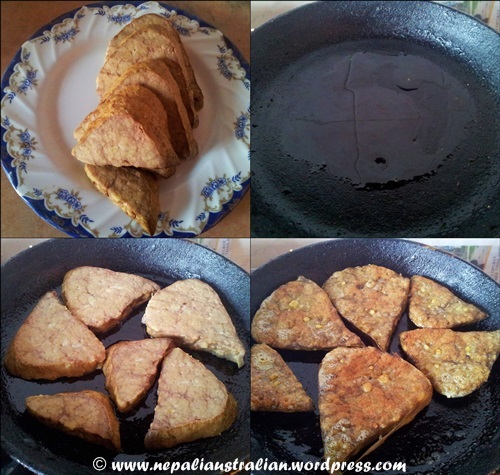 As I am from Newar community so it is very common in our household to have these delicacies. Most of you may not know it but fried lungs are one of the tastiest of delicacies. If done the right way, Phokso fried (fried lungs) are very tasty. AS was craving it when we were in Nepal. As we were a bit scared to eat out, my MIL decided to cook one at home and at the same time teach AS and me how to do it. In order to have a perfect Phokso fried, you must make sure you buy fresh lungs without any punctures. 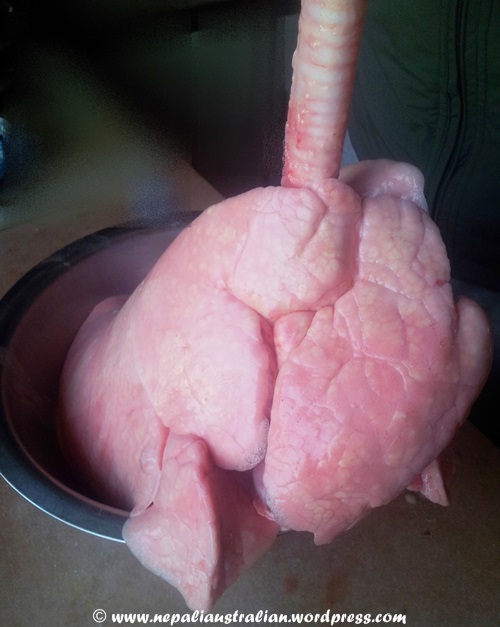 In Nepal, they blow air into the lungs at the butcher’s to show that it is a good one. Once lungs are ready, it must be cleaned properly to make sure there is no blood left in the vessels. To clean it, pour water in it through its trachea multiple times until all coagulated blood remaining in the lungs come out. At the end, pour a few tablespoonful of oil into each lung. 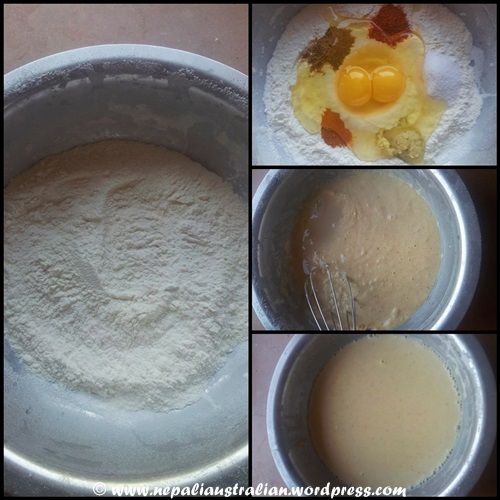 Put the flour in a dish and place all ingredients over it. Mix all ingredients together until all lumps are gone. The mix should be a bit watery. To make sure there are no lumps in the mixture; strain the mixture through the strainer. Use whisker if required. Fill a plastic bag (we used milk bag in Nepal but you can use zip lock bag) with the mixture. Place the end of the trachea into the opening of the bag and clamp your fingers over them to seal them. Pump the mixture in the bag into the trachea. When the lungs become full you will notice that the outer skin will be smooth and shiny. When the lungs are full, don’t just let the trachea go as the lungs will pump the mixture out quite rapidly. Keep holding the trachea! To seal the trachea, peel and cut the potato and insert the cut potato into the opening of the trachea. Shove it inside then fold and seal trachea by tying with a kitchen string. This will make sure the batter doesn’t flow out while it is being boiled. In a big pot, boil water and add turmeric powder. 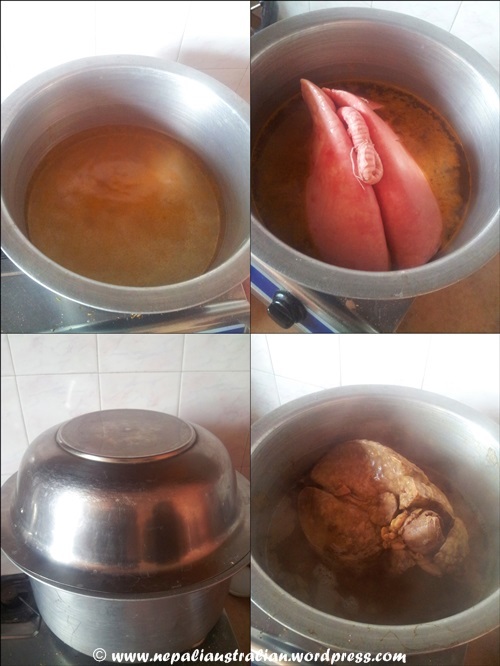 Add the lungs and cook it. You may need to turn it over to make sure all sides get cooked. Once the lungs are cooked, let it cool down before cutting it. Slice the lungs into pieces a few centimetres thick pieces. In a fry pan, heat oil and lay the sliced lungs in one layer. Once one side is crispy and brown in colour, turn and fry the other side. Take the fried lungs out on a plate. Mix salt, chill power and cumin powder in the plate. Sprinkle this mix on the fried lungs. It is best served hot. 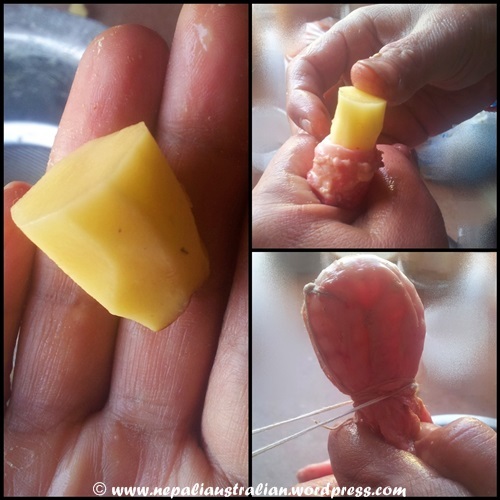 This entry was posted in Nepali food, Newari Culture, Newari Food, Recipe and tagged brain (gidi), feet (khutta), fried intestines (aandra), fried solidified blood (rakati), fry goat lungs, head (tauko), how to eat offal, how to fry goat lungs, how to fry lungs, kidney, liver (kalejo), lungs (phokso), stomach skin (bhundi), tongue (jibro). Bookmark the permalink. Hi. 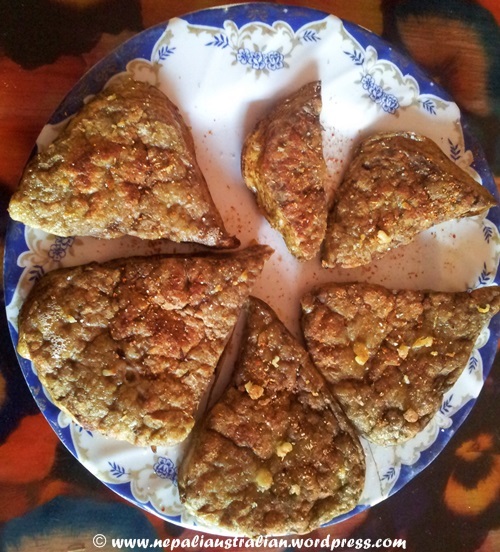 I’m part Newari from my mom’s side and have enjoyed bhundi n rakta ko bhutwa when I ws a kid. Have been missing the recipe for long. Wud love to have it from u since she is no longer there to teach me. Namaste – as you might be aware from my blog, I have just come back from a two month long stay in Nepal. Nepal feels like my second home, as I love it so much. Well one of my favourite things from there is, Mo Mo and I am looking for the recipe!! My question to you is do you do requests? 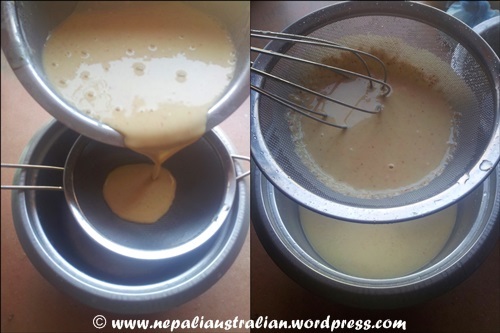 I for one would absolutely love to read how to make Mo Mo,and being one of Nepal’s traditional dishes, I was wondering whether might want to cover it – (big question I know). I bought the masala, so I just need the practical advice on how to prepare it; its for my mother really as she will be doing the cooking!! I am so glad to know that you loved your stay in Nepal. It is so nice to see someone else loving and enjoying the country I love so much. Do let me know if you need more help. I am happy to help :). Take care. I am squeamish. It’s like the outcry over the recent horsemeat scandal in Britain though – people get show the truth and they don’t like it. I mean they are wlling to eat cow but not horse? It would make sense if the idea of eating horse appalled them as vegetarians but as meat eaters? I take your point. I ought to be vegetarian! Thanks dear. That is so true. I guess the outcry is probably for labeling it as beef more than it being horse itself. I know there are many parts of world horse meat is normal. Reading the nepali-english dictionary of organs in the first para, my guess would be that Kidney is called “gurda” or something close. Gidi is brain in Nepali. You can get these dishes in a restaurant called Yeti in Hauz Khas Village in Delhi! It’s always jam packed with foreigners. It’s also one of the only places you can get good spicy fried pork dishes (which my husband loves so he’s always dragging me there). The most adventurous I’ve been with Nepali food is tama, lol. Wow !! what a thoroughly explained one. As I started to read, i was apprehensive for how will I feel; as i eat chicken and fish only and have not tasted Red meat in my life. 🙂 But this amazing post is useful for my hubby and family as they all love mutton. Actually all parts of a goat as you described above. Your MIL is great enough to serve you such delicacies. Enjoy. My MIL is domestic goddess and she loves what she does. 🙂 AS really enjoy his treat and hope your family will as well ..